Small white earthenware mug with Beatty & Haig. Small white ceramic mug with coloured transfer decoration. The principal design comprises sepia portrait photographs of Admiral Beatty and Field Marshal Sir Douglas Haig (portrait busts each enclosed by an oval laurel wreath); between the two portraits is the full-length figure of Britannia ,with lion, within a stylised architectural niche; at the base of the design is a scroll marked 'BEATTY', 'FOR FREEDOM AND HONOUR', and ''HAIG'. 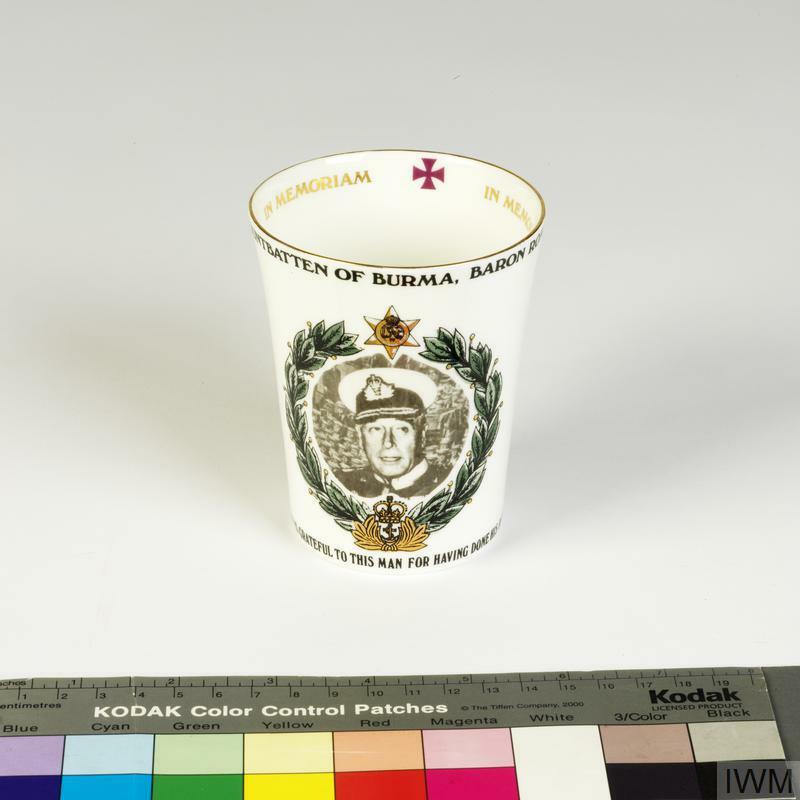 At the rear of the mug is the text (applied by transfer): 'A MEMENTO OF / THE / GREAT WAR/ COMMENCED AUG 4TH 1914 / ARMISTICE NOV 11TH 1918 / PEACE SIGNED JUNE 28TH 1919'. Immediate post-First World War period Staffordshire earthenware mug commemorating the signing of the Treaty of Versailles on 28 June 1919.